Among the many poker tournaments currently ongoing has been the conclusion of the Seminole Hard Rock Poker Open series in Hollywood, Florida. The EPTLive crew traveled to the Sunshine state this week to cover the conclusion of both the $100,000 Super High Roller — won last night by Jake Schindler — and the $10 Million Guaranteed SHRPO Main Event for which the final table kicks off at 2 p.m. Eastern time this afternoon. Fans of EPTLive are once again enjoying getting to see the “cards up” coverage of this week’s final tables in Florida. James Hartigan and Joe Stapleton are handling the commentary as usual, and as is often the case at the European stops, they’re having pros join them in the booth to help comment on the strategy. 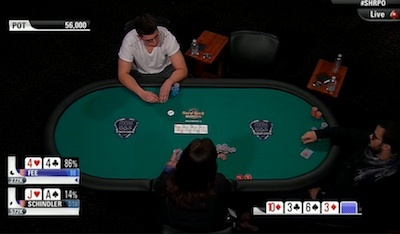 Many times watching such a broadcast can prove highly illuminating, such as happened last night when Tristan “Cre8ive” Wade joined the pair to help with the analysis of Schnidler’s heads-up battle with eventual runner-up Ryan Fee. 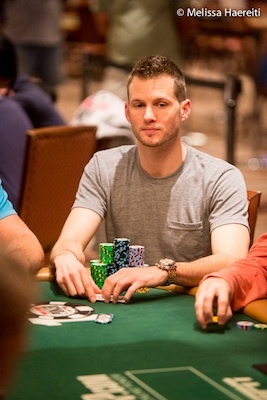 Schnidler had the chip advantage for much of what turned out to be a lengthy heads-up duel. There were a number of interesting hands played between him and Fee, and the gradually developing dynamic between the pair as their match wore on was fun to follow as well. The two of them had been at it for a couple of hours last night when some of the show’s Twitter followers — noting how Schindler was up over 580,000 to Fee’s stack of about 285,000 — began tweeting that the end was likely near. But with the blinds just 3,000/6,000 with a 1,000 ante, Wade remarked how both players were still plenty deep-stacked given that Schindler had close to 100 big blinds while Fee still had nearly 50. Soon Wade was offering more insightful commentary during a hand that developed shortly afterwards, one that began with Schindler raising the minimum to 12,000 from the button with , Fee calling with , then the pair watching a flop come . “So we’ve got a pair versus two overcards,” said Stapleton. “Yeah, a good flop for two fours without flopping a four,” chimed in Wade. “He’s gonna check-call here,” he added, and indeed Fee checked, Schindler made a continuation bet of 15,000 (a little over half the pot), and Fee called. “Schindler’s got a hand that has a lot of equity,” Wade went on to say, noting that he was likely going to double- or even triple-barrel going forward depending on how the turn and river came. This time Fee led with a smallish bet of 15,000, and Wade explained that likely Fee felt his fours were ahead and “had value,” that he was “trying to control the pot,” and that “he probably doesn’t expect to get raised here.” But noting that Schindler had a good “ace-high” hand, Wade added that Schindler probably wasn’t going to fold, either. As they waited for Schindler to act, Stapleton asked about Fee’s turn bet. “This is [for] a little protection... right?” asked Stapleton, alluding to Wade’s “control the pot” comment and the fact that Fee’s bet appeared to function as a blocking bet in the hand. “Yes, this is a very small bet by Ryan,” said Wade, agreeing that it seemed to have been made in an effort to keep Schindler from making the pot uncomfortably big. Before Wade could comment further, though, Schindler surprised them a little by putting in a raise to 35,000. The river then brought a fortunate card for Schindler — the — giving him a better pair. Wade immediately predicted that Fee likely wouldn’t be able to do anything but check and that Schindler would value bet, which was exactly what happened as Fee checked, Schindler bet 75,000 into the 126,000-chip pot, and Fee folded. Play moved on, with Stapleton pointing out how frustrating the hand probably was for Fee given that he might well have thought he played it well, but without knowing Schindler’s hand doubts would remain. Wade added as a postscript how he had a small problem with Fee’s leading turn bet, preferring a check-call since the bet put him in an awkward spot. The discussion of that hand continued into the next one, with further analysis of Fee’s turn bet and Schindler’s response. For those watching attentively, it amounted to a kind of ongoing — and free! — tutorial about heads-up no-limit hold’em, making the show not just fun to follow, but educational as well. 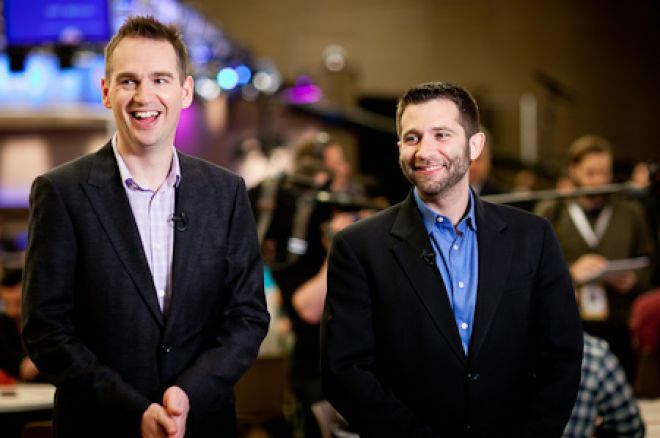 I enjoy watching the EPTLive streams, not least because I find Hartigan and Stapleton so entertaining, frequently find myself laughing out loud at their humorous banter. But they also do an especially good job with their coverage to provide solid strategic advice along the way, too, for those seeking it. The hosts also help us non-professionals by asking the pros joining them good strategic questions and getting them to comment on what can sometimes be very high-level play on display — as was the case last night. For more interesting poker — and instruction in tournament strategy, too — check out today’s live stream over at for the SHRPO Main Event final table.